Today I got the unfortunate news that demolishing works have started on the bunkers of the beautiful and famous Stützpunkt 120 “Pommern” on the beach south of Wissant. 2,5 years ago the local government decided to demolish the bunkers. Now, all the bunkers on the beach including the iconic Regelbau 600 with stairs, 630 in the anti-tank wall, 501, 612 and all other concrete remains will disappear. A real loss to the Atlantikwall..
Aargh, one of our first bunker-site’s when we start with our beautifull hobby… a real loss! Last news Folks: the chosen demolition society decided to give it up, works didn’t go further a lot in january. A new one have to be chosen. Good to hear! How far in the process were they? Is the 612 gone already? So sad to hear of the destruction of Stp Pommerne, ive visited this site many times and it was a fantastic example of the Atlantic wall and so close to England and it brought many tourists to Wissant. Have just seen some of Herv’e Olejniczak pictures of the destruction of Stp Pommern on Axis history forum. What a sad sight, these bunkers were a part of modern day history and now are only memories. 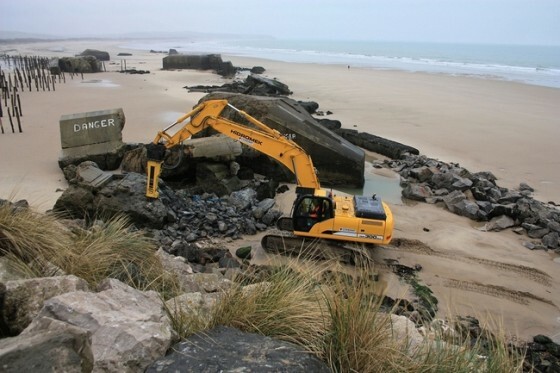 Thankfully we have historians who have worked with local goverment and have been able to preserve Atlantic Wall fortifications along the French and Belguim coast for future generations to see, sadly Wissant has lost a piece of its history forever.